• Fast and sensitive. Use of 20 µL sample. 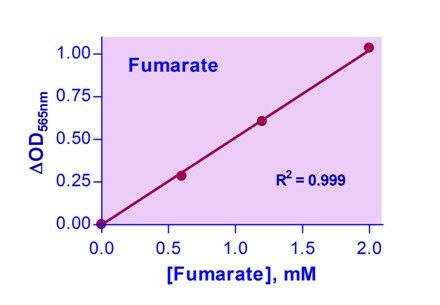 Linear detection range 0.005 to 2 mM fumarate in 96-well plate assay. • Convenient. The procedure involves adding a single working reagent, and reading the optical density after 30 minutes. Room temperature assay. No 37°C heater is needed. FUMARATE , or Fumaric Acid, is one of the key components in TCA cycle and is used by cells to form ATP. Human skin when exposed to sunlight will naturally produce fumaric acid. Fumarate is used as an additive by the food and beverage industries. Fumaric acid esters are also used to treat psoriasis. Increased urinary fumarate may be due to impaired Krebs cycle function, a defect in the enzyme fumarase or mitochondrial function. 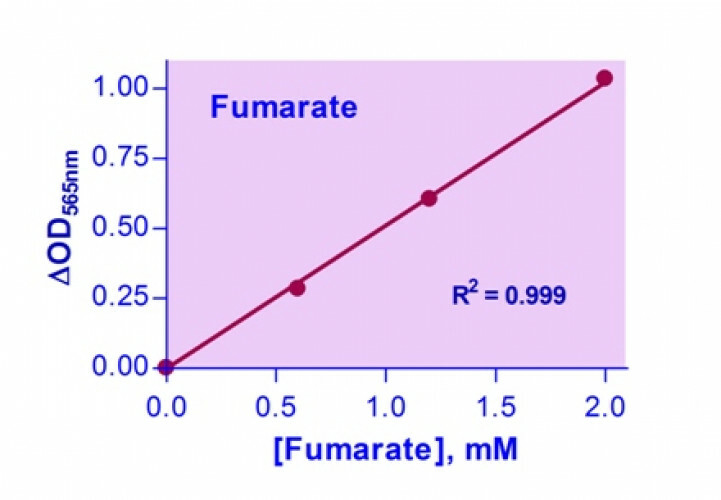 BioAssay Systems’ fumarate assay kit is based on fumarase catalyzed hydration of fumarate to malate. The malate is then oxidized by malate dehydrogenase generating NADH which reduces a formazan (MTT) dye. The intensity of the product color, measured at 565 nm is proportional to the fumarate concentration in the sample. Applications For quantitative determination of fumarate and drug effects on its metabolism.